Our clients never pay any additional emergency fees! West Hills Animal Hospital & Emergency Center is equipped with in-hospital state of the art diagnostic technology to aid us in making a thorough and rapid diagnosis of your pet’s condition, either on an emergency basis or during a regularly scheduled wellness exam. West Hills Animal Hospital & Emergency Center has teamed up with Idexx Laboratories, Inc. to offer consultations by board certified veterinary radiologists 24 hours a day, 7 days a week. This allows us to obtain consultations on diagnostic imaging at the click of a button within hours, any time of the day or night, further enhancing the care provided for your pet. Idexx employs over 35 board-certified veterinary radiologists (DACVR). Board Certification requires three years of a residency program after completion of veterinary school. CT Scan Services are performed at our Gold Coast Center for Veterinary Care location. Our Vimago™ HD Volumetric Imaging™ system can scan as much of your pet as needed so we can optimally diagnose and treat with the greatest confidence. We can also use the system as a fluoroscopy platform allowing us to see real time, moving, x-ray images to help with diagnosis and aid us in minimally invasive procedures. While the vast majority of times sedation is not necessary, sedation may be recommended to limit stress to your pet and help us to get the highest quality diagnostic images. Allows us to visualize the architecture of your pet's internal organs. Performed by one of our specially-trained veterinarians with state of the art equipment in our hospital, providing convenience, expertise and immediate results. Typically does not require any form of sedation. Allows us to safely obtain tissue samples by ultrasound guided needle aspirates or biopsy. Allows us to visualize the structure and assess the function of the heart. Use of Doppler allows blood flow to be visualized and evaluated. Non-invasive, safe, and usually does not require sedation. Helps determine cardiac changes and which medications or procedures should be utilized to help slow progression of the heart disease. Performed by one of our specialty trained veterinarians using state of the art equipment in our hospital. 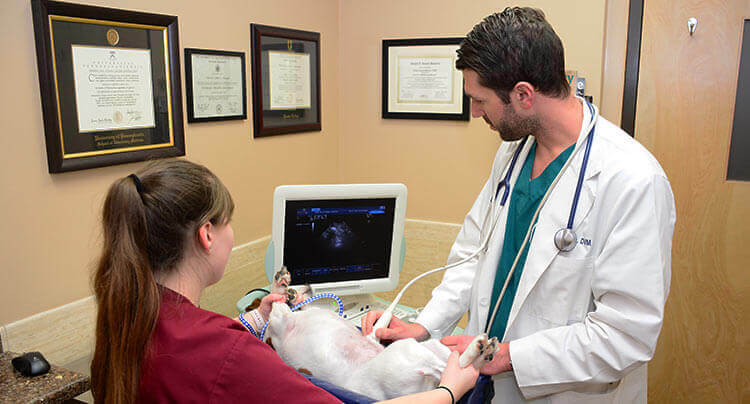 Minimally invasive procedure that allows our specially-trained veterinarians to view inside the pet’s body and visualize some of the organs and internal systems without performing surgery. Allows examination of the pet’s upper gastrointestinal tract, lungs, colon, nose and nasal passages. Allows us to take biopsies utilizing specialized instruments inserted through a channel in the endoscope. Minimal time your pet is under anesthesia. Your pet typically does not experience pain or discomfort after the procedure. Staffed by skilled, trained technicians. Allows us to remove many foreign bodies in the gastrointestinal tract without requiring exploratory surgery. Screening tests for Canine Parvovirus, and Feline Leukemia and FIV viruses. Cytology examination of ear, skin, urine and blood specimen. Screening tests for Heartworm Disease and other tick-borne diseases (Lyme, Ehrlichia, and Anaplasma). Evaluation of blood clotting times. Any samples not ran in-house are sent to our reference laboratory with multiple pick-ups each day, allowing for your pet’s lab results in a timely manner. Clients of West Hills Animal Hospital & Emergency Center never pay any additional after-hours emergency fees! West Hills Animal Hospital & Emergency Center is open 24/7 and has veterinarians on staff 24 hours a day. We are a full service veterinary practice, animal emergency, and specialty animal hospital serving all of Long Island including the surrounding communities of Babylon, Bellmore, Bethpage, Brentwood, Brookville, Commack, Deer Park, Dix Hills, East Meadow, East Northport, Farmingdale, Glen Cove, Hicksville, Huntington, Islip, Jericho, Kings Park, Levittown, Lindenhurst, Locust Valley, Massapequa, Melville, Northport, Roslyn, Oyster Bay, Plainview, Smithtown, Syosset, Wantagh & Westbury.